I think that all readers have their own literary bucket list of books that they want to read before they die. Mine are all big baggy things that I want to gorge myself on: James Joyce’s Ulysses, Anthony Powell’s Dance to the Music of Time, Frank Moorhouse’s ‘Edith trilogy’, Eleanor Dark’s Timeless Land trilogy, and Proust’s À la recherche du temps perdu (I’ve read two, but I’d like to read them one after the other). I did have on this list Montaigne’s Essays, but it has occurred to me that Montaigne doesn’t require the big Christmas holiday commitment like these other books do. He’s better read in small snatches, and is indeed tailor-made for an e-reader because, after all, who’d want to cart that hefty volume around on the off-chance of the quick dip? In fact, it occurs to me that Montaigne would have made a fantastic blogger, because his Essays are quirky and digressive, just as a good blog is. 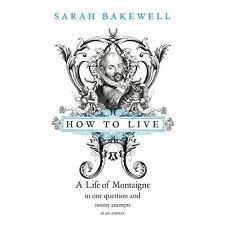 [An aside- one of my favourite, digressive, informed and very Montaignesque blogs is Historians are Past Caring] This book, How to Live, is a biography in the quirky and digressive spirit of Montaigne too. It, like Montaigne, takes the question “how to live?” and distills twenty answers that Montaigne might have given, as prisms onto Montaigne the man and his work. The twenty attempts at an answer? Don’t worry about death; pay attention; be born; read a lot, forget most of what you read, and be slow-witted; survive love and loss; use little tricks; keep a private room behind the shop; be convivial, live with others; wake from the sleep of habit; live temperately; guard your humanity; do something no one has done before; see the world; do a good job but not too good a job; philosophize only by accident; reflect on everything but regret nothing; give up control; be ordinary and imperfect; let life be its own answer. As you might sense from these chapter headings, this is a biography, but it doesn’t read as such. At the end of the book the author includes a chronology of Montaigne’s life- even the placement of this chronology at the back of the book rather than at the front is surprising- and I was comforted to find that I had somehow gleaned the major trajectories of Montaigne’s life, even though the author had zig-zagged chronologically throughout the book. The book is generously peppered with artwork- black and white, unfortunately- but in good Montaignian spirit it is not captioned, leading you to wonder what it is, and why it’s there. The notes at the back provide the details, as well as full footnotes and references. This is a well-researched book, but it wears the research lightly and plays with it in good humour, just as Montaigne himself might have done. Bakewell places his life within the political and cultural milieu of the time, and locates it within a broader philosophical palette. I particularly liked her exploration of Montaigne as a Phyrrhonian Sceptic- someone who is happy to suspend judgment, as a sort of mental calm and openness to uncertainty. It is this diffidence and openness to question that makes Montaigne such delightful company. In a world of braying certainty from the media, fundamentalist religions and partisan politics, it’s refreshing to watch someone walk around a topic, trailing off into tangents and viewing it from different angles. In good blogger fashion, Montaigne was willing to go back to adjust his ideas, modify his stance and raise questions with himself- much as bloggers often go back to tweak a post. Of course, this wrought havoc with the different editions of his essays as they were released, as he changed words, qualified his opinions and inserted paragraphs. 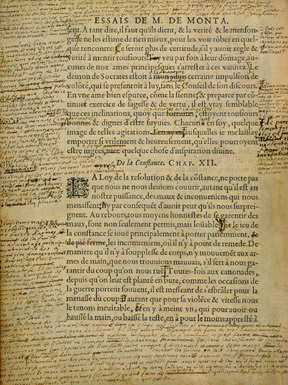 Montaigne’s annotations, corrections and insertions to his own text prior to republication of a new edition, Bordeaux copy. She also traces the history of the Essays as an artefact through its different editions and translations. In a very Montaignian spirit, it seems that there is no absolutely definitive edition, and that each has its drawbacks and advantages, and might have been changed yet again had Montaigne had opportunity to publish yet another edition. So Montaigne’s Essays have moved up the menu on my e-reader for the quick dabble. Somehow, I think that’s just the way he’d like them to be read, too. It’s cold and wet, in the way that winter days used to be. Three years ago, in the midst of drought, I was wondering if I’d ever see one of these wet days from my childhood again- the ones where you wake up to the sound of rain that just goes on and on. But here a rainy day is back, although I note from the weather segment that once again this rain is courtesy of low pressure troughs moving down from the north, quite unlike the across-the-Nullabor weather patterns that I’ve been used to all my life. Weather notwithstanding, off we toddled to the National Gallery of Victoria to take advantage of the members’ free entry today to the Fred Williams exhibition. I really don’t know why I keep going back to the Fed Square gallery (other than being forced to if I want to see particular exhibitions) because it always enrages me. My chagrin starts with the cobbled, windswept forecourt. It is bleak in winter and baking in summer, uneven, and slopes upwards onto an artificially created hill that ensures that the whole Federation Square complex completely blocks any sight of the river. 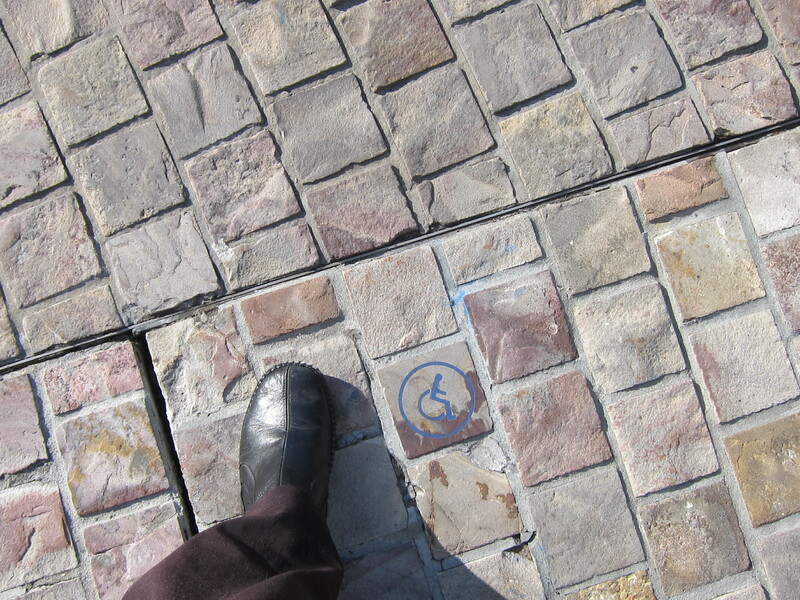 It amuses me that the so-called ‘accessibility’ markers that denote a slightly smoother path are themselves virtually indistinguishable from the rest of the cobblestones. Then, how to get into the damned gallery? You’ve got to hand it to the NGV- in both the Fed Square and the International Galleries, the doors are squirrelled away out of sight- I mean, you wouldn’t want anyone to come IN would you? Having solved the mystery of getting in to the gallery, and having passed the highly prominent and clearly-sign posted shop (the only thing, along with the ticket box, that is clearly signposted in the whole building) your next task is to work out how to get upstairs, as the exhibition you want is most certainly upstairs. Ah- there’s the escalator- a little single-file, one-way escalator tucked away in a corner. You want to go down again? I’m yet to find the down-escalator, but I have found the wooden staircase that has the steps sawn off at an angle like spiral steps, but in a squared, boxlike structure. Or there’s another staircase that just goes on and on and on upwards- oddly I’ve never found how to get down again. Isn’t there some regulation about landings in staircases?? Exhibition seen, now for coffee! There’s the cafe with a narrow window that looks out onto the river- well, it would if it weren’t covered with artistically hung black mesh. What goes in, must come out-so where ARE the toilets? Ah, there’s a subtle little sign over in the corner, virtually indistinguishable. The door opens into a stygian darkness, which lifts slightly over the cubicles, but barely enough to detect the flush buttons that are mere engravings on the stainless steel walls. The whole place is so damned impractical and must break every possible regulation in terms of accessibility and safety. I have no idea how they could evacuate the building in an emergency. It’s architectural pretension run amok. Am I in a bad mood today? Perhaps I am. Let’s just say that I’m glad I had free entry to the Fred Williams exhibition. I’m with Robert Nelson on this one- his review Dogged dabs of a blobby dazzler pretty much sums it up for me. Fortunately my rainy day at the NGV was saved by “Intimate Landscapes”, the Fred Kruger exhibition of photographs– no, not the Nightmare on Elm Street Freddy Krueger, but instead the German photographer who worked in Victoria between 1860s-80s. He was a travelling commercial photographer who was contracted, among other things, to photograph the Aboriginal people living at Coranderrk mission, near Healesville for the Aborigines Protection Board. His photographs, intended to highlight the industry of the inhabitants, and the success of the mission, are freighted with all the “dying race” and “clean and useful” philosophies of the time. He also took photographs of bridges, reservoirs, and rivers, often with small human figures alongside. In a feat of organisation, he took a large group shot of literally hundreds of school children outside Flinders Primary School in 1880- you can see it here. There are street shots of Queenscliff, Geelong and Ballarat as well. Fascinating, and well worth the cobblestones and steps, clammy umbrellas and wet socks. One of the things that I love about doing my thesis on the colonial career of a 19th century judge- and yes, I did just (still?) use the word ‘love’- is that it has taken me to three and a half very different colonial settings in my research. [Three and a half because Port Phillip was officially part of New South Wales, but I see it as a qualitatively different type of society to Sydney.] The self-imposed need to knuckle down to start to write thematically has prodded me to turn to the West Indian aspect of my judge’s career- and so, where to start other than a Short History of the West Indies? In 1968 the New Zealand historian Keith Sinclair wrote a cheekily-titled article called “On Writing Shist”. No, it’s not a typo- ‘Shist’ is an abbreviation for “Short History”: all countries have them (often with “Short History” in the title), and many eminent historians tackle them. Even though, as Keith Sinclair points out, a short history is written for an “educated non-specialist”, the reality is that often they’re read by people wanting an overview of their own history, and especially by other historians coolly interested to see how their colleagues, already known by their other work, tackle the task. It’s a quite different readership when the reader is a complete outsider who knows very little about the topic beyond a vague idea of the country being “over there somewhere”. Keith Sinclair described Shist as a “summary interpretation of a topic, intended to make it understandable… an extended kind of explanation”. In such a book, facts form a “very thin hard skeleton…[ selected]… in relation to the pattern of the whole book”. The tag cloud in the Google books description is quite pertinent here because it emphasizes that the book is largely concerned with places (Jamaica, Cuba etc) rather than people or events. The book is arranged chronologically, as you might expect, and as the first edition was published in 1956, it would appear to have had extra chapters added as it spawned its second edition in 1963, third in 1971 and this final one in 1987. Given that the book has been reprinted so many times with 16 reprints and 4 editions, it has been disconcerting and rather confidence-sapping to find so many typographical and date errors in the text. In a Shist, Sinclair said, the problem is not so much what to include, but what to leave out. Themes are established, dropped, and picked up again. Authors have to deal with the twin narrative problems of shape “the over-all pattern of ideas, facts and prose, woven into a unity” and span- “how one chapter, one hill, will roll gently into the next. How to present, now and again, an unexpected or dramatic vista”. In this regard, what I gleaned from this book- which may or not be what the authors intended, and may or may not be what someone more familiar with the topic might detect- is first, that West Indian history didn’t really begin until the fifteenth century. The indigenous Arawak people are dispensed with in a couple of pages. Second, that this is very much a sea-based history, both in terms of the geographic sprinkling of islands across the West Indian basin, as well as in the maritime prowess of the European powers that plied their influence there. Third, that the history of the West Indies is completely wound up in the machinations of these European powers- the Dutch, the Spanish, the French and the English- and their wars, treaties and truces. Fourth, that the monoculture crop of sugar profoundly affected the history of the region as a whole in terms of slavery, social structure and power relationships and the economy. Fifth, that a history of the West Indies needs to be seen within the context of U.S. history of power. Sixth, that even though the islands tended to see themselves in a closed loop tied to their metropolitan power, it is important to look across these different historical metropolitan affiliations to see the rhythm and pace of change across the region as a whole. I don’t know enough to detect what is new or different in this short history compared with others that have been written before and since. Nonetheless, it had me thoroughly engrossed, with many ‘aha!’s as the pieces fell into place, especially in regard to the Dutch influence in European history. I note that the authors describe the slave rebellions in Haiti, Jamaica and St Vincent as “The Second war of American Independence”. 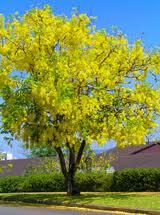 I liked their use of the cassia tree as an emblem for West Indian history following emancipation- the leaves and bark are lost, then suddenly it bursts into golden flower. I suspect that the maritime emphasis reflected the enthusiasms of the historian J.H. Parry in particular, and that there is a political thread running through the commentary on seeing the region as a whole, and on the relationship with the United States. 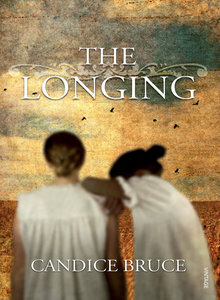 It is probably a history of its time in terms of the sidelining of indigenous history and women. This is a history of big powers and big forces, rather than individuals. I’m full of enthusiasm to wade further into the mud flats of British Guiana history! Do people do Sunday drives anymore? 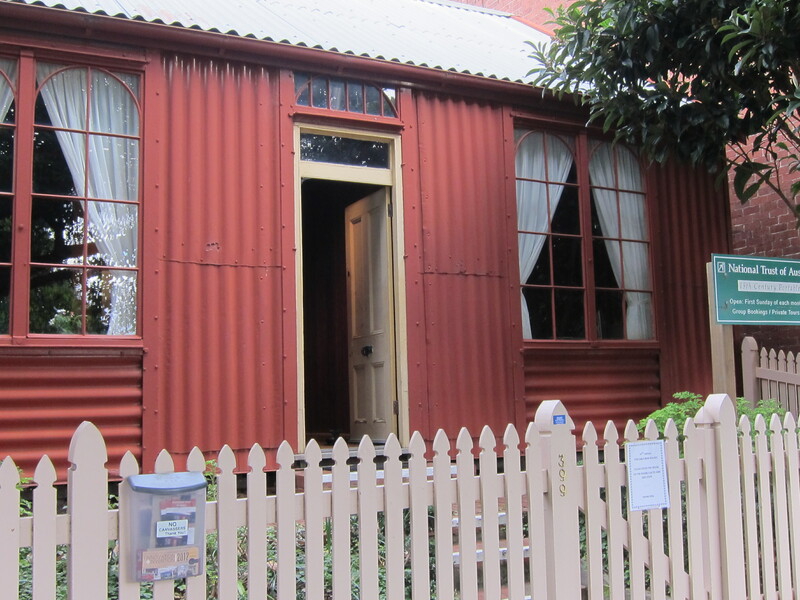 We did- across the Yarra and down to South Melbourne to look at the Portable Iron Houses in Coventry Street South Melbourne. 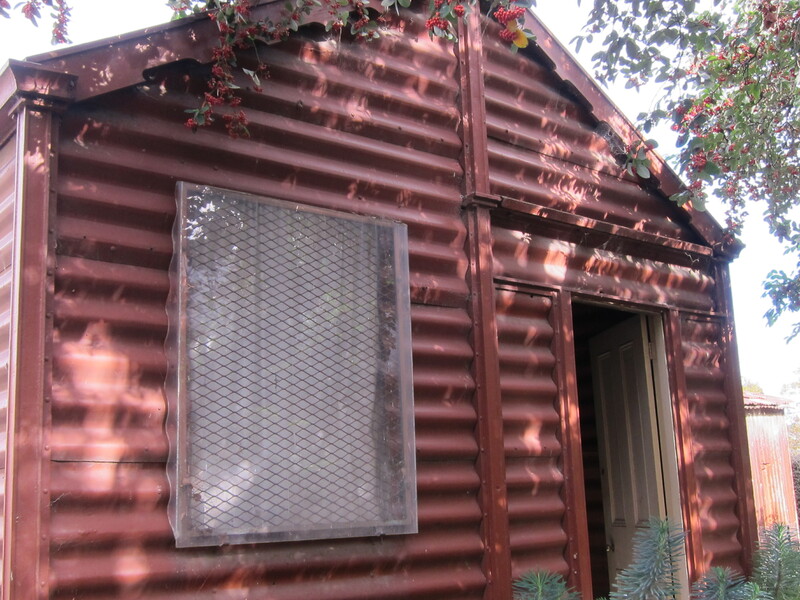 There are three galvanized iron houses on the South Melbourne site. The one facing Coventry Street, shown above, is still in its original position where, in 1855 it was one of nearly one hundred portable buildings in the vicinity that included cottages, two-storey houses, shops, stores and a coach house. It was valued at 60 pounds when it was erected in 1853/4. 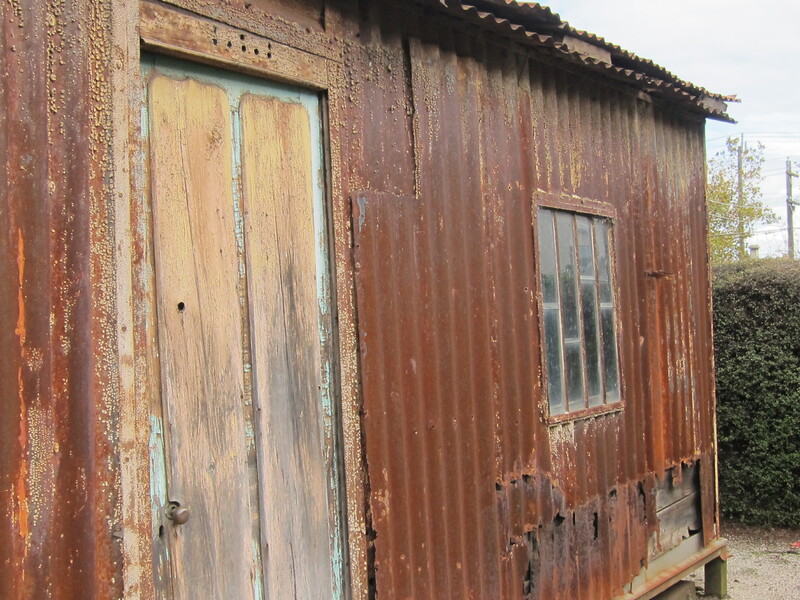 Portable iron houses were packed in wooden cases (which could be used to line the internal walls) and easily transported by ship or cart. They were quickly erected and could be unbolted and dismantled to be taken elsewhere for re-erection as a practical and enterprising solution to the dire housing shortage in gold-rush Melbourne. The house above contained four rooms on the ground floor, with two attic bedrooms that are reached by a precipitous stairway. I found it hard to envisage negotiating these stairs- barely more than a ladder really- with a babe in arms. The temperature of the attic rooms in summer must have been fearsome too. The second house on the side, Bellhouse House, was originally built at 42 Moor Street Fitzroy. (by the way, it should be ‘jalousie’ window, which apparently is just a louvre window). 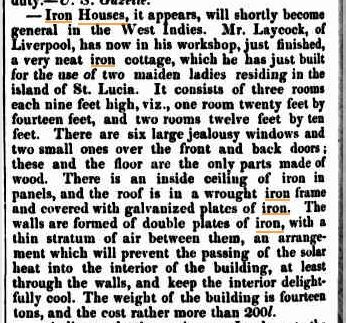 There had been timber pre-fabricated houses as well (La Trobe’s cottage is a good example) but with these iron houses we are talking mass-produced, cheap, urban housing that could be manufactured in Britain and shipped to colonies throughout the world. The iron on the Bellhouse House runs horizontally, and it would have originally contained three rooms. I must admit that I found it rather charmless. The house that I was most intrigued by was Abercrombie House, which faces Patterson Place at the back, where there were originally fourteen houses of a smaller size erected by the entrepreneur who erected the Coventry Street House. 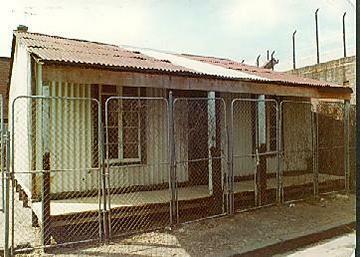 This particular house was moved from its original location at 59 Arden Street, North Melboune in about 1980. You can see a picture of the house still in North Melbourne here and it being shifted by semi-trailer after being cut in half here. They must have had their hearts in their mouths while they were moving it, because it is certainly in a very precarious condition. It was last occupied in 1976, and standing there looking at the single light bulging hessian-covered ceiling and the layers of wall paper, it’s hard to credit that such primitive living conditions still existed in the middle of Melbourne forty-odd years ago. But conversely, on a wet and cold winter’s day, it’s also important to recognize what a vast improvement this house would have been on the canvas tents that were the alternative. The Portable Iron Houses are presented by the National Trust, and they are open on the first Sunday of the month 1-4 p.m.